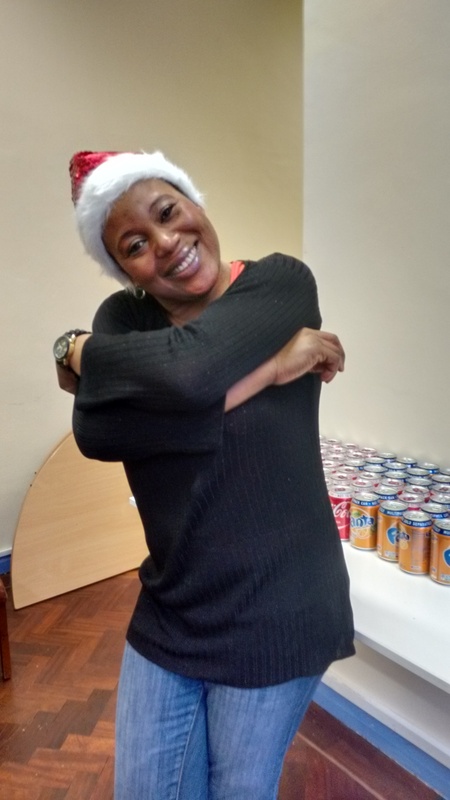 On Monday 7 December, Women Asylum Seekers Together (WAST) London celebrated their last meeting of 2015 with a very merry Christmas party, featuring a fantastic array of drama, singing and dancing, plenty of delicious food, festive decorations, and generously donated gifts. Over 70 women who have sought asylum in the UK came along. These women have left homes from all over the world – Afghanistan to South Sudan, the Congo to Iran. Most of them have made arduous journeys to escape war, imprisonment or family abuse, and many of them are still struggling to find safety in the UK. But for a few hours everyone tried to put troubles to one side and celebrate the fact that refugees are welcome here. The afternoon kicked off with a Christmas story, followed by a performance from the beginner’s English class, who sang ‘My Bonnie sails over the ocean’. After the first round of performances, we all tucked in to a delicious lunchtime feast, prepared and served by members of our incredibly hardworking WAST management committee – a huge thank you to them for all their work to make the day possible, and for doing it all with their usual passion, energy, and big grins! After lunch, we were treated to a play that the WAST drama group has been putting together all term, based on their own experiences and struggles with the asylum system. 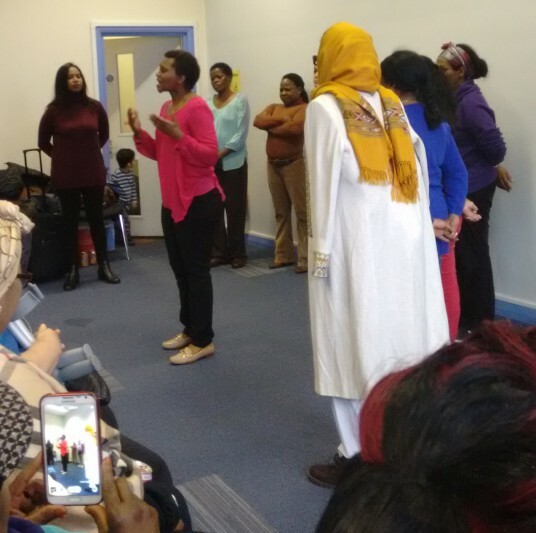 From the culture of disbelief in the Home Office, and the anti-immigration rhetoric asylum seekers face from the public and the media, to the humiliation and trauma of being detained, the play offered a moving and all too familiar insight into the lives of women seeking asylum in the UK. Well done to them for their hard work in putting the piece together this term, and a big thank you to our drama facilitators Munira and Caroline. 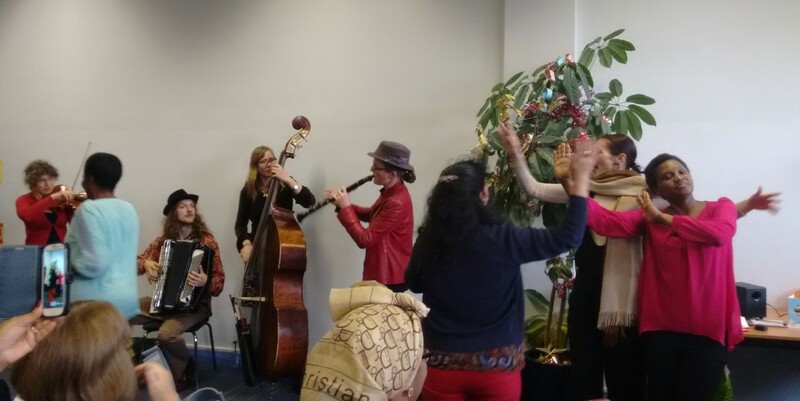 Finally, the highlight of the afternoon was a hugely entertaining performance from the London Klezmer Quartet, whose lively music successfully got many of the women out of their seats and dancing. 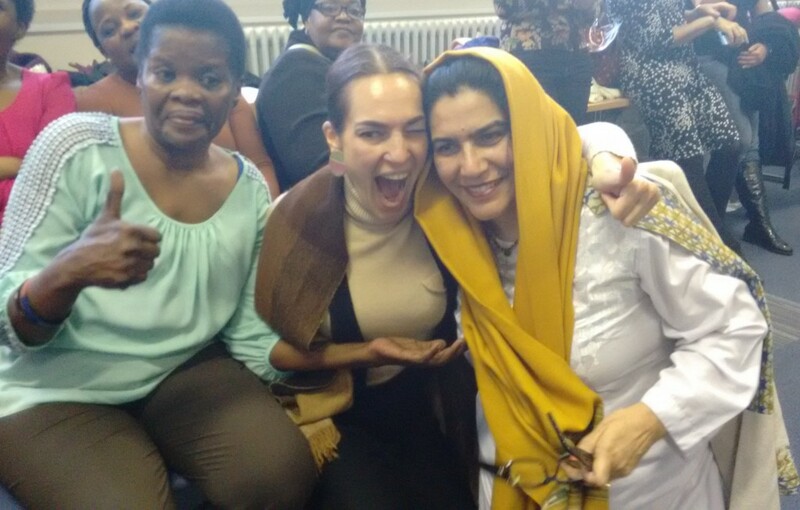 London Refugee Women’s Forum secretary Jade led the way on the dance floor, along with flamenco teacher Beatriz, with lots more women and children getting into the festive spirit and showing us their best moves. 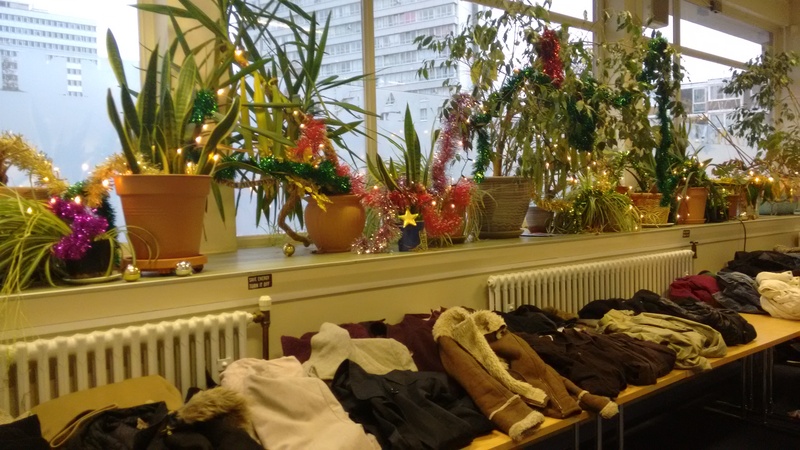 As we wrapped up for the afternoon, the women were delighted to leave with gifts so generously donated by our supporters – from warm winter coats for them and their children, to beauty products, bubble baths and gorgeous smellies that the WAST management committee (again!) worked so hard to sort and package into individual gift bags for us. The generosity of all our supporters was overwhelming, but special thanks must go to: Lush, Grazia magazine, Elle magazine, The Perfume Society, Camden Refugee Aid, the Shoreditch Sisters and Borough Belles Women’s Institute groups, Hands On London, Kings College London’s feminist and STAR (Student Action for Refugees) societies, KCWC, and the London Klezmer Quartet. 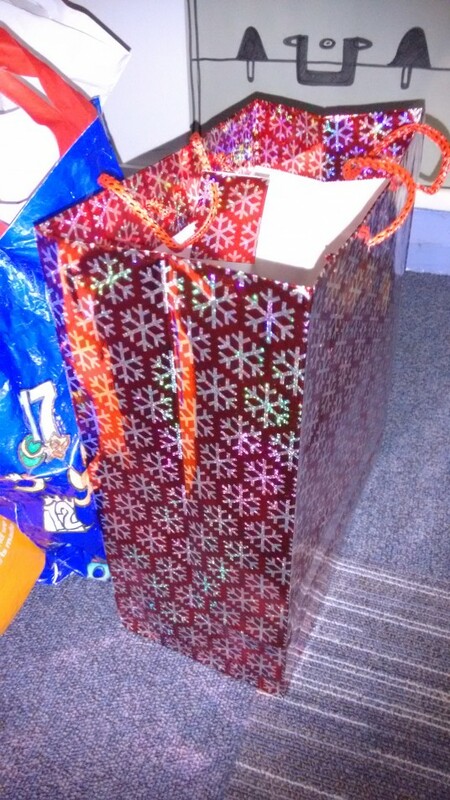 Thank you to absolutely everyone else who donated gifts and time, and we’re really sorry to anyone who we’ve not managed to thank personally; your donations are all so appreciated. Thanks also to members of the London Refugee Women’s Forum and WAST management committee for your tireless work, not just on Monday but throughout the year, to support other women. Thank you to our trustees; our volunteers Judith Cravitz, Hannah Sandhu and Alma Agusti; our intern Jinan Golley; our brilliant volunteer English teachers Laura Mosedale, Julie Taylor Mills, Eve MacDonald, Francesca Brooks, Helen Brown, Justine Brown, Sara Cotingham, Jane Chan; our yoga teacher Chuchu Ayele; and to everyone else who took time out of their Monday afternoon to come along. We were thrilled so many of you could make it to the party and hope you enjoyed it as much as we did. And of course, thank you to my colleague Marchu Girma, without whom none of Women for Refugee Women’s amazing grassroots work would be possible. 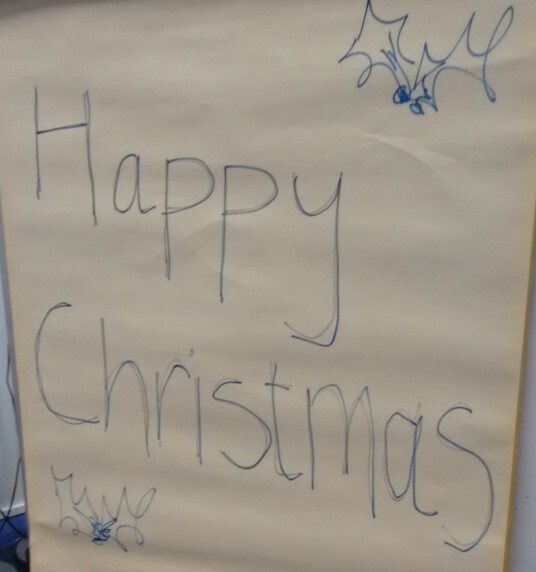 Our regular Monday WAST meetings will resume in the second week of January, but for now all of us here at Women for Refugee Women would like to wish you all a very merry Christmas and a happy New Year.